Prosecutors are trying to determine whether a Florida city commissioner should be charged in the fatal shooting of a man he accused of shoplifting a hatchet from an Army-Navy surplus store. 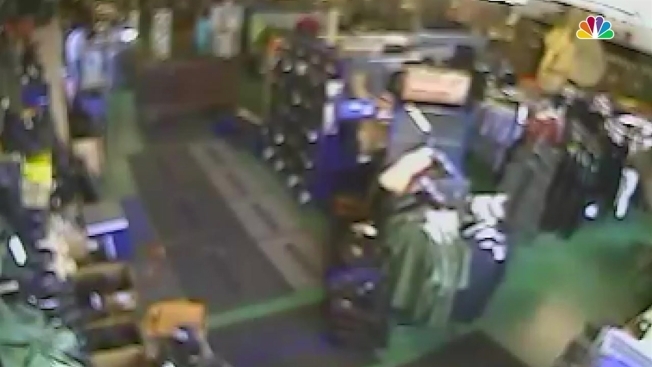 Surveillance video shows the store's co-owner, Lakeland Commissioner Michael Dunn, shooting Cristobal Lopez on Oct. 3. It shows Dunn holding a gun in his right hand while trying to keep Lopez from carrying the hatchet out of the store. Dunn grabs a fistful of his shirt and Lopez is partly out the door, raising the hatchet, when Dunn fires and Lopez falls, mortally wounded. Dunn's attorney, Rusty Franklin, told the Tampa Bay Times it was justified because Lopez was holding the hatchet. No charges have been filed against Dunn as Florida law requires prosecutors to prove a shooting was not justified under the state's controversial "Stand Your Ground" law. The law says people are justified in using deadly force and do not have a "duty to retreat" if they believe it is necessary to prevent death or great bodily harm. A former prosecutor with the Pinellas-Pasco State Attorney’s Office told the Times that Lopez appears to be fleeing when he was shot and the video did not contain evidence that he tried to use the hatchet as a weapon against Dunn. "It appears in the video that all the force is being used by the commissioner," Bill Loughery said. Prosecutor Jacob Orr said Monday that keeping the video secret didn't benefit the investigation. WFLA-TV reports Dunn did not attend Monday's commission meeting, with his lawyer saying Dunn did not want to be a "distraction." The State Attorney's office anticipates the investigation will finish by the end of the week, according to the station.